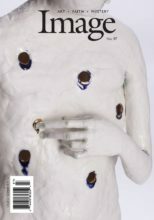 Image Issue 99 mailed in mid-December—our last issue in double-digits! 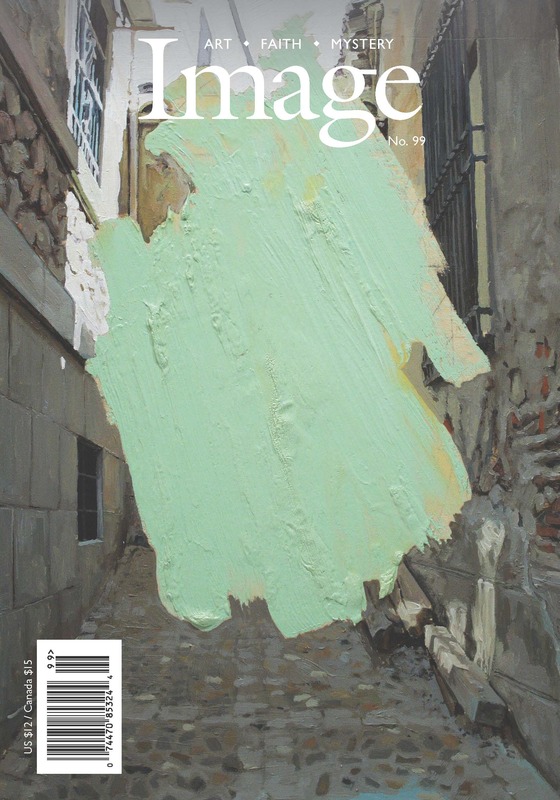 The cover features the art of Jonathan Anderson, who disrupts the surfaces of his architectural paintings with streaks of paint. They’re strangely beautiful; they also force you to stop and think about what you’re doing when you look a painting. Katie Kresser’s essay “Christ as Chimera” investigates strange and even monstrous images of Jesus from across art history—from the second-century Alexamenos graffito to Andres Serrano—and argues that works like these can help us more deeply understand both the incarnation and the all-encompassing nature of the cosmic Christ. James K.A. Smith’s debut editorial statement, “In Praise of Boredom,” argues for the capacity of art to help us slow down. Producer and singer-songwriter Joe Henry interviews Linford Detweiler of Over the Rhine. Samuel Martin reviews story collections by Kirstin Valdez Quade, Chanelle Benz, and Melissa Kuipers. Recent Image Milton fellow Sonya Bilocerkowycz on the most famous Ukrainian restaurant in America—and how following the threads of history can lead to uncomfortable truths. Plus an anonymous essay by a writer who has taken fiction writer Denis Johnson as his patron saint. Two short stories, by Miriam Cohen and Andrew Graff, explore the aftermath of growing up in—and then leaving—two different restrictive religious subcultures. With poems by Rafael Campo, Daniel Tobin, Gina Franco, Lauren Camp, and John Blair. Sonya Bilocerkowycz was a recent Milton Fellow at Image. Her first book, On Our Way Home from the Revolution, winner of the Gournay Prize, is forthcoming from Mad Creek Books, an imprint of Ohio State University Press. “Veselka” is an excerpt from this. John Blair has published six books, the most recent of which is Playful Song Called Beautiful (Iowa), as well as poems and stories in Poetry, Colorado Review, Antioch Review, and elsewhere. Colin Cheney is the author of Here Be Monsters (Georgia), a National Poetry Series selection. He has received a Pushcart Prize and a Ruth Lilly Fellowship. He lives with his family in Maine. Miriam Cohen’s work has appeared in Black Warrior Review, StoryQuarterly, West Branch Wired, Cream City Review, Florida Review, Diagram, Carve, Cimarron Review, The Collagist, Bennington Review, Joyland, Fugue, Hobart, and Witness. Jaclyn Dwyer is the author of The Bride Aflame (Black Lawrence). She is assistant professor and director of creative writing at Malone University in Ohio, where she is working on a novel. Gina Franco was awarded the 2019 CantoMundo Poetry Prize for The Accidental (forthcoming from Arkansas) and is also the author of The Keepsake Storm (Arizona). Her work has recently appeared in 32 Poems, America, Crazyhorse, Los Angeles Review, Poetry, and West Branch Wired. She teaches at Knox College. Andrew J. Graff holds an MFA in fiction from the University of Iowa Writers’ Workshop. He currently teaches creative writing at Cedarville University in Ohio and is at work on a novel. Joe Henry is a singer-songwriter and producer who has produced albums for Allen Toussaint, Aimee Mann, Bettye LaVette, Loudon Wainwright III, Meshell Ndegeocello, Bonnie Raitt, and many others. His most recent albums of his own music include Reverie, Invisible Hour, and Thrum. In 2017 he and Billy Bragg released Shine a Light: Field Recordings from the Great American Railroad, a collection of music recorded at railway stations. Carrie Purcell Kahler’s work has appeared in Arcturus, District Lit, Hobart, DMQ Review, Dudley Review, Broken Bridge Review, and others. She teaches piano, manages events for Poetry Northwest, and lives in Seattle with her husband and cat. Katie Kresser is professor of art history at Seattle Pacific University. She has some credentials. She writes and thinks slowly and painfully, navigating the Scylla and Charybdis of vanity and fear. She is beloved by God, thank goodness. Samuel Martin is the author of the story collection This Ramshackle Tabernacle and the novel A Blessed Snarl (both from Breakwater). His fiction has been nominated for the Winterset, ReLit, and Dublin IMPAC awards and has won ScreenCraft’s Cinematic Short Story Award. He teaches creative writing at Northwestern College in Iowa. Erik Norbie was selected as a winner of the Kalanithi Writing Award and a finalist for the Loft Mentor Series. His work has appeared in Bellevue Literary Review, Columbia Poetry Review, and Gulf Stream, among others. Nicholas Samaras is from Patmos, Greece, the island on which John received his vision of the apocalypse. At the time of the Greek military junta, Samaras was brought to be raised in exile in America. His books are Hands of the Saddlemaker (Yale) and American Psalm, World Psalm (Ashland Poetry). Jack Stewart was educated at the University of Alabama and Emory University and was later a Brittain Fellow at the Georgia Institute of Technology. His work has appeared in Image, Poetry, Field, and other journals. He lives in Coconut Creek, Florida. Daniel Tobin is the author of eight books of poems, including From Nothing and Blood Labors (both from Four Way). His versions of Paul Celan’s German poems appear in The Stone in the Air (Salmon). His honors include a Massachusetts Book Award, Julia Ward Howe Award, and Meringoff Award, as well as fellowships from the NEA and Guggenheim Foundation. Jesse Wallis’s poems have appeared or are forthcoming in Barrow Street, New Ohio Review, Poetry East, Southern Poetry Review, Southern Review, and elsewhere. He studied writing at the University of Iowa and currently lives in the Phoenix metro area. Miriam Cohen and Andrew Graff interview each other about their "Stories of Departure" in Image Issue 99.